The Sun is a variable star whose observed magnetic activity varies on a timescale of about 11 years and impacts life on Earth. The Sun’s magnetic field originates in the solar interior and global helioseismology, which studies the Sun’s natural resonant oscillations (p modes), offers a unique opportunity to probe conditions beneath the solar surface. The Sun’s p modes are trapped in the solar interior and are sensitive to the physical conditions of the gas through which they travel. Each mode samples slightly different, but overlapping, regions and so, by examining the properties of many different modes we can build up a profile of the solar interior. Here we report a signal in the frequencies of p modes with a period of approximately 2 years, that is related to the quasi-biennial signal observed in other proxies of solar activity (e.g. 10.7cm flux and sunspot number). However, unlike the other proxies, the signal observed in the p-mode frequencies persists throughout the most recent, unusual solar minimum. What can this tell us about the properties, including the magnetic properties, of the solar interior during this time? It has been known since the mid 1980s that p-mode frequencies vary throughout the solar cycle with the frequencies being at their largest when the solar activity is at its maximum (e.g. ; ). For a low-angular-degree (low-l) mode at about 3000μHz the change in frequency between solar maximum and minimum is about 0.4μHz. By examining the changes in the observed p-mode frequencies throughout the solar cycle we can learn about solar-cycle-related processes that occur beneath the Sun’s surface. The Birmingham Solar-Oscillations Network (BiSON) is in a unique position to study the changes in oscillation frequencies that accompany the solar cycle as it has now been collecting data for over 30 years. BiSON makes Sun-as-a-star (unresolved) Doppler velocity observations, which are sensitive to the p modes with the largest horizontal scales (or the lowest l). Consequently, the BiSON measurements are the truly global modes of the Sun. These modes travel to the Sun’s core, but their dwell time at the surface is longer than at the solar core because the sound speed inside the Sun increases with depth. Therefore, the low-l modes are most sensitive to variations in interior regions close to the surface and so are able to give a global picture of the influence of near-surface activity. Figure 1 shows a frequency-power spectrum (which is the squared modulus of the Fourier transform of the time series) of 365 days of BiSON data. The rich comb-like structure of p modes is clearly visible in the spectrum. 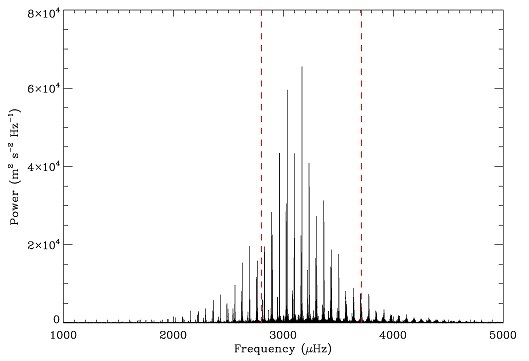 Figure 1: A frequency-power spectrum of BiSON data. The time series used to create this spectrum was 365d in length. The vertical lines mark the frequency band used when calculating the solar cycle frequency shifts shown in Figures 2 and 3. Figure 2 shows mean frequency shifts of the p modes observed by BiSON (also see ) and a scaled version of the 10.7cm flux. The 11-year cycle is seen clearly but what causes the observed frequency shifts? A likely candidate is the magnetic field. Broadly speaking, the magnetic fields can affect the modes in two ways. They can do so directly, by the action of the Lorentz force on the gas. This provides an additional (to gas pressure) restoring force, resulting in an increase of frequency, and the appearance of new modes. Magnetic fields can also change the physical properties in the mode cavities and, as a result, the propagation of the acoustic waves within them. This indirect effect can act both ways, to either increase or decrease the frequencies. Figure 2: Average frequency shifts of "Sun-as-a-star p modes. " Notice that the most recent seismic minimum was deep, not only compared to the previous minimum but also compared to the 10.7cm flux. Furthermore large departures of the seismic signal from the 10.7cm flux are observed during the declining phase of the last cycle and the recent, unusual solar minimum. This could indicate that the relationship between the internal magnetic flux and that which manifests at the surface (and is responsible for the 10.7cm signal) has changed. Figure 2 shows that shorter term variations are also visible in the frequency shifts, on top of the dominant 11-yr cycle (e.g. ). 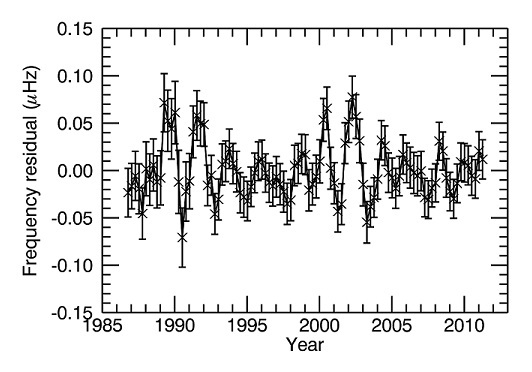 Figure 3 shows the residuals of the frequency shifts once the 11-yr solar cycle has been removed. A periodicity on a timescale of about 2 years is clearly visible, and we find that this is statistically significant . The amplitude envelope of the quasi-biennial signal observed in the BiSON data appears to be modulated by the 11-year cycle. Figure 3: Residuals of the frequency shifts, plotted in Figure 2, left after the dominant 11-yr signal has been removed. The residuals were found only for the frequency shifts observed after April 14th 1986 as before this date the data are too sparse to be able to see the quasi-biennial signal. One possible explanation for the 11-year modulation of the quasi-biennial signal is that the flux responsible for the shorter-period variation is positioned somewhat below the solar surface (~5 percent) and buoyant magnetic flux sent upward by the main dynamo from deeper layers, at the base of the convective envelope, could help to nudge this overlying flux into layers that are shallow enough to imprint a detectable acoustic signature on the modes. 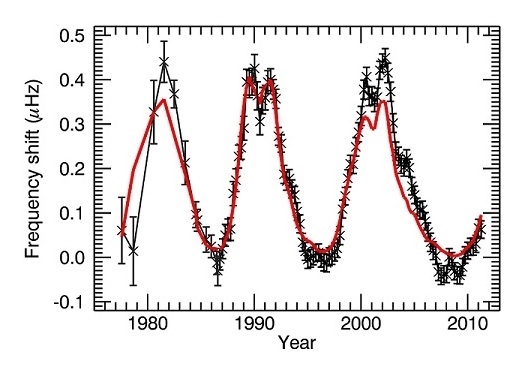 The amplitude of the quasi-biennial signal would be large when the 11-year cycle is at or close to solar maximum. When the main cycle is near solar minimum, the flux responsible for the quasi-biennial signal would not receive an extra nudge, and the amplitude of the signal in the p-mode frequencies would be weaker. While p-mode frequencies respond to conditions beneath the surface, activity proxies respond to changes at or above the surface. The quasi-biennial signals observed in other solar activity proxies are only detectable during phases of moderate to high activity (see, e.g. ;  and references therein). This fits with the above conjecture: The quasi-biennial signal would only be visible in surface proxies of the Sun’s magnetic field when brought to the surface by the flux generated by the main dynamo. Seismic changes continue throughout the last two solar minima, particularly evident during the most recent, unusually long solar minimum. A clear suggestion of our work is that conditions on the surface does not necessarily reflect what is happening in the solar interior! S. T. Fletcher, A.-M. Broomhall, D. Salabert, S. Basu, W. J. Chaplin, Y. Elsworth, R. A. García, and R. New, 2010, ApJL, 718, L19. A. Vecchio and V. Carbone, 2008, ApJ, 683, 536. D. H. Hathaway, 2010, Living Reviews in Solar Physics, 7, 1.